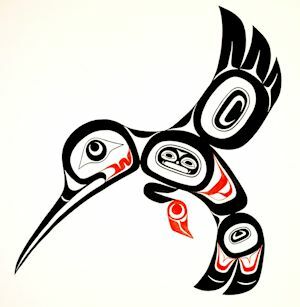 In Pacific Coast native culture, the Hummingbird symbolizes beauty, intelligence, and love. He sends messages to the people of things to come. A messenger of joy, this beautiful tiny bird is also called Sah Sen and represents friendship, playfulness and is a symbol of good luck in Northwest Coastal Native art. Hummingbird’s ability to hover back and forth at great speeds is believed to be a skill for guiding the people; if they fall behind Hummingbird can easily back up to keep pace. One story of Hummingbird tells of a warm, spring day. Summer was coming and the wild flowers were in full blossom. A young girl and her mother waded through the green grass, enjoying the bright colors. They stopped as Hummingbird joined them while bussing and darting from flower to flower. Many years ago there was a fragrant flower that rose every spring to display her beautiful petals and bright colors for all the world’s creatures to enjoy. The people and animals waited anxiously each spring for this special flower to appear. On that day they knew the warm, kind rays of summer had arrived. Raven saw how much joy this flower brought to the world, so the next spring when it appeared, he transformed it into a tiny bird. The bird had the colors of the green spring grass and the flashing red of a setting sun. Raven gave the bird a special gift – to fly like sunlight flickering through tall trees. He also gave it a message to take to all the flowers. That’s why today we see Hummingbird buzzing from flower to flower, whispering a message. Hummingbird is thanking each flower for making our world a more beautiful place.